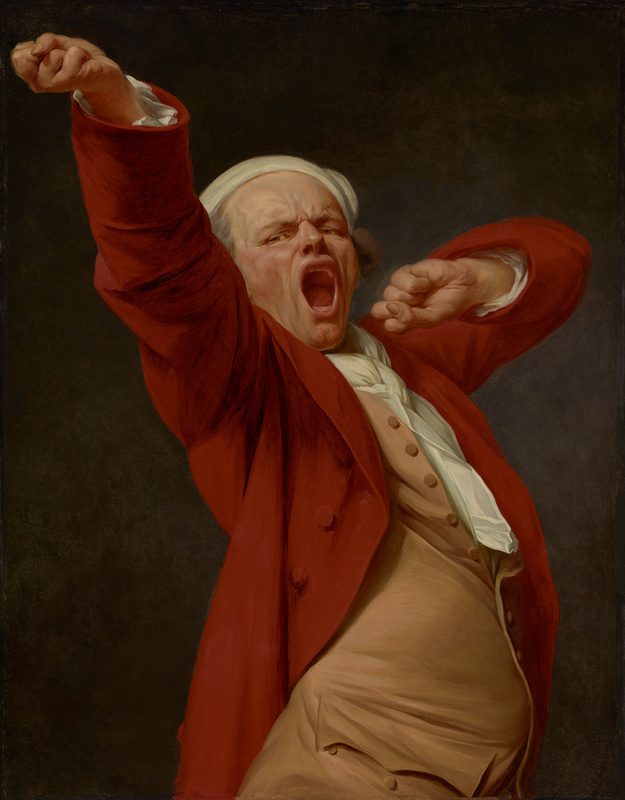 Joseph Ducreux experimented with the traditional limitations of the genre of self-portraiture by creating an expressive, humorous, and rather unorthodox image of himself stretching and yawning. Dressed informally in a turban and bright red jacket, Ducreux, in the midst of a huge yawn, opens his mouth wide, contorting his face with the effort and stretching his right arm toward the viewer. Holding this exaggerated pose, his back sways and his stomach pushes forward; his entire body presses up close to the surface of the picture. Ducreux was interested in the study of physiognomy and frequently used his own features as a convenient means to observe various expressions. In fact, he executed dozens of similarly exaggerated self-portraits throughout his career. A contemporary critic admired this self-portrait for its warmth, color, and expression, but later critics complained about the repetition of the subject. Source: Letter from Weitzner to B. Fredericksen (February 16, 1977). Ouvrages de peinture, sculpture, et architecture, gravures, dessins, modèles, &c. exposés au Louvre par ordre de l'Assemblée nationale au mois de septembre 1791, l'an III de la liberté, exh. cat. (Paris: l'Imprimerie des Batimens du Roi, 1791), p. 52, no. 698. Bellier de la Chavignerie, Émile. Les artistes français du XVIIIe siècle oubliés ou dédaignés (Paris: Veuve Jules Renouard, 1865; repr., Geneva: Minkoff, 1973), p. 69. Dorbec, Prosper. "Joseph Ducreux." Gazette des beaux-arts 36, no. 591 (September 1906), pp. 207-8. Oulmont, Charles. "À propos d'un portrait de Joseph Ducreux par lui-même." Revue de l'art ancien et moderne 29, no. 166 (January 1911), pp. 122-23, ill.
Locquin, Jean. "Ducreux." In Allgemeines Lexikon der bildenden Künstler von der Antike bis zur Gegenwart. Ulrich Thieme and Felix Becker, eds. 37 vols. (Leipzig: Seeman, 1907-50), vol. 10 (1914), p. 46. Lyon, Georgette. Joseph Ducreux: Premier peintre de Marie-Antoinette (1735-1802) (Paris: La nef de Paris, 1958), pp. 73, 80, 170-71, 273n7. Armingeat, Jacqueline. "Ducreux et la grimace." Gazette des beaux-arts 55 (May 1960), p. 358. Adhémar, Jean. "Ducreux's Le Discret: An Attribution Established." The Register of the Museum of Art 2, no. 6 (June 1961), p. 5. Sotheby & Co., London. Catalogue of Old Master Paintings. March 5, 1969, p. 35, no. 132. Palais Galliera advertisement. La revue du Louvre 21, no. 4/5 (1971), p. iv, ill.
Palais Galliera, Paris. Importants tableaux et dessins de Maîtres anciens. November 25, 1971, unpaginated, lot 14, ill.
"Conseils aux acheteurs: Les portraits 'de caractère'; Les seuls recherchés du 18e." Connaissance des arts, no. 241 (March 1972), p. 127, fig. 2. Bordeaux, Jean-Luc. "The J. Paul Getty Museum: La peinture française." Connaissance des arts, no. 278 (April 1975), p. 84. From Watteau to David: A Century of French Art, exh. cat. (New York: Maurice Segoura Gallery, with Christophe P. Janet/Maurice Segoura, 1982), p. 48, under nos. 13, 14. English Drawings, exh. cat. (London: Hazlitt, Gooden & Fox, 1990), p. 92, under no. 45. Siegfried, Susan L. The Art of Louis-Léopold Boilly: Modern Life in Napoleonic France (New Haven and London: Yale University Press, 1995), pp. 123, 126, fig. 107. Jaffé, David. Summary Catalogue of European Paintings in the J. Paul Getty Museum (Los Angeles: J. Paul Getty Museum, 1997), p. 37, ill.
Denk, Claudia. Artiste, Citoyen & Philosophe: Der Künstler und sein Bildnis im Zeitalter der französischen Aufklärung (Munich: Wilhelm Fink, 1998), pp. 201, 204, fig. 90. Middelkoop, Norbert, ed. Kopstukken: Amsterdammers geportretteerd, 1600-1800, exh. cat. (Amsterdam: Amsterdams Historisch Museum, with Uitgeverij Thoth, 2002), pp. 67-68, fig. 82. Oppenheimer, Margaret A. The French Portrait: Revolution to Restoration, exh. cat. (Northampton, MA: Smith College Museum of Art, 2005), pp. 74, 76. Fønss, Thyge Christian. "Ud af Tvivlen. Thomas Kluge som portrætmaler." In Thomas Kluge: gud, konge og fædreland, exh. cat. Malene Linell Ipsen, Thomas Kluge, and Gerd Rathje, eds. (Kerteminde: Johannes Larsen Museet, 2015), p. 88-89, ill.
Jackall, Yuriko, et al. America Collects Eighteenth-Century French Painting, exh. cat. (Washington, D. C.: National Gallery of Art, with Lund Humphries, 2017), p. 268, ill. p. 269. Earle, Susan. "Joseph Ducreux, John Maxon, and the Spencer Museum of Art." In America Collects Eighteenth-Century French Painting, exh. cat. Yuriko Jackall et al. (Washington: National Gallery of Art, with Lund Humphries, 2017), p. 122. Students examine Charles-Antoine Coypel's Self-Portrait and understand what he shows in this work.